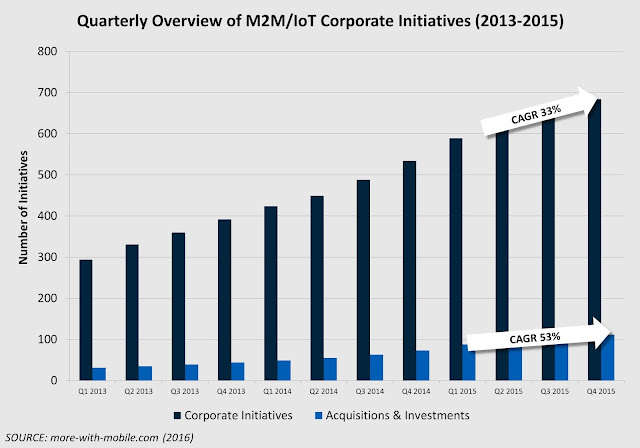 Corporate activity in the M2M/IoT market continues to grow in line with the roughly 30% growth rate that many market analysts forecast for connected devices. Acquisition and investment activity grew at a much faster rate over the past few years and reflects a positive corporate attitude to this important market. Mobile network operators (MNOs) were very active especially in the low-power, wide-area networking (LPWAN) arena which is positive in terms of driving industry scale. Companies in the platform services segment were even more active highlighting the scope for value creation higher up the industry value chain. The industry dynamics between MNOs and platform service providers will set up an interesting strategic challenge – that of scale vs. value – which will affect all market participants over the coming years. Following on from an industry strategy project in 2008, I began to monitor corporate initiatives in the M2M/IoT market. I wanted to gauge how companies were responding to the new commercial opportunities through business (as distinct from technology) actions. The different approaches that companies employ provide evidence of corporate priorities. The end of 2015 showed no abatement in corporate activity and a steady growth rate of 33% (over the prior 3-years). Acquisition and investment activity, very much a case of hard financial outlays, grew at 53% over the same period. Notable investments include IBM’s $2bn acquisition of the WeatherChannel which will develop into a key data feed for IoT applications, especially in the agri-business arena. PTC continues to build out its industry position and IoT platform capabilities through two $100m-plus acquisitions in the areas of analytics (ColdLight) and industrial automation (Kepware). The network segment, below the platform layer in the M2M value chain, was another area of investment activity as low-power wide-area networking providers gained market traction. SigFox and LoRA Alliance companies engaged with go-to-market partners to expand their presence and operational footprint in new geographical markets. This prompted a reaction from the open-standards, mobile industry in the form of a 3GPP standardization push for low-powered wide-area networking initiative, via the GSMA. The strategies of platform service providers and network operators epitomises the dynamic between growth through scale and growth from climbing up the value chain through application enablers (e.g. analytics, inter-operable data exchanges etc.) and platform services. The following comparison of different strategic approaches employed by MNOs and platform service providers illustrates how the latter group of companies is expanding its strategic role in the IoT market. 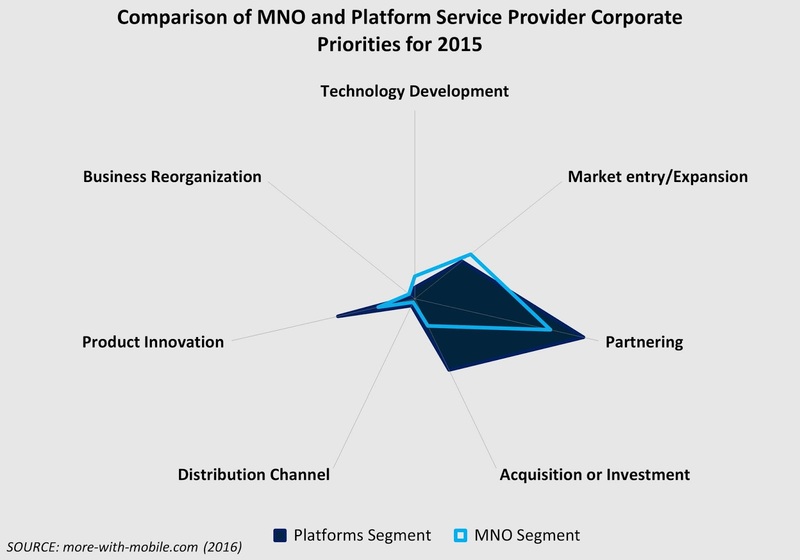 Platform service providers were more active in partnering, investing and product innovation compared to MNOs. Many of the partnering activities involved mobile and low-power, wide area network operators to deliver connectivity management services. There were early signs of partnering deals at the application enablement layer and, in a few cases, these involved systems integrators who are clearly looking for packaged solutions to expand their role in the IoT market. IBM’s WeatherChannel acquisition typifies this class of initiative where companies are looking for capabilities and assets to gain a foothold in the IoT market. As far as investment and product innovation activities are concerned, these involved investments to enhance platform capabilities and cross-investments in partners with complementary capabilities. Partnering in the MNO segment involved arrangements with technology vendors and the emerging breed of (proprietary) LPWA network operators. In some cases, this was backed up by cross investments. Several of the product innovation initiatives related to MNO entries into the M2M market (in less sophisticated telecoms markets). Among different MNOs, AT&T looks to be a harbinger of the IoT future with its innovation in the connected home (through AT&T Digital Life) as well as its forays into data exchanges (AT&T M2X) and experiments aimed at delivering end-to-end IoT applications. MNO support for LPWA and connected home markets place them on a high-volume market expansion trajectory. In evolving from tradition mobile to low-power mobile, they will soon have to cross the boundary into managing mixed-population devices i.e. mobile and non-mobile devices (Wi-Fi, Bluetooth etc.) in order to play a part in the full end-user service experience. The challenge they will have to overcome is one of massive ‘ARPU’ dilution. To put this into perspective, market pricing of connectivity for LPWA devices is roughly one-tenth of most mobile M2M devices (excluding high-throughput devices using video for security monitoring, for example). Data pricing for non-mobile devices (short-range wireless) is effectively zero. This is the point at which a scale-based strategy needs a value-driven complement. One conclusion is that many network operators will become active in the platform-services and IoT applications segments over the coming years as they seek new sources of value and the revenue streams necessary to offset the diluted contribution from connectivity services.